SKU: CE0706. 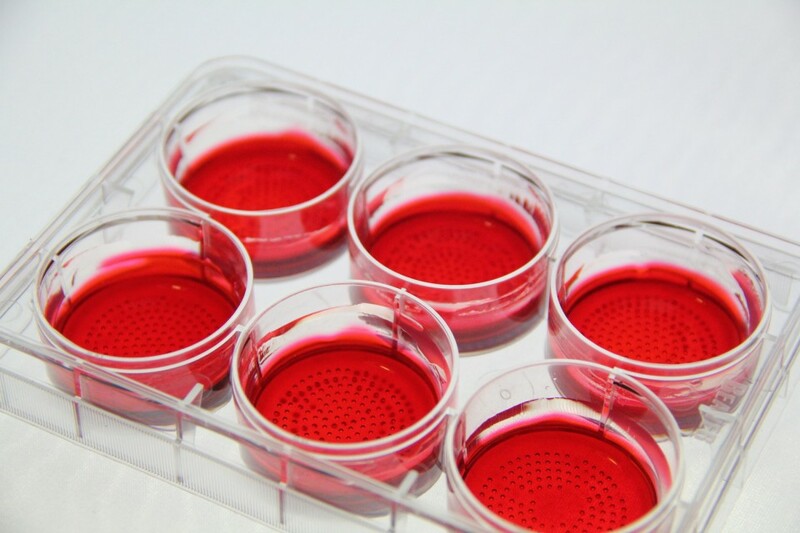 Category: CellSphere™ 3D Cell Culture Plate. Abstract:We report a technology to form human embryoid bodies (hEBs) from singularized human embryonic stem cells (hESCs) without the use of the p160 rho-associated coiled-coil kinase inhibitor (ROCKi) or centrifugation (spin). hEB formation was tested under four conditions: +ROCKi/+spin, +ROCKi/-spin, -ROCKi/+spin, and -ROCKi/-spin. Cell suspensions of BG01V/hOG and H9 hESC lines were pipetted into non-adherent hydrogel substrates containing defined microwell arrays. hEBs of consistent size and spherical geometry can be formed in each of the four conditions, including the -ROCKi/-spin condition. The hEBs formed under the -ROCKi/-spin condition differentiated to develop the three embryonic germ layers and tissues derived from each of the germ layers. This simplified hEB production technique offers homogeneity in hEB size and shape to support synchronous differentiation, elimination of the ROCKi xeno-factor and rate-limiting centrifugation treatment, and low-cost scalability, which will directly support automated, large-scale production of hEBs and hESC-derived cells needed for clinical, research, or therapeutic applications. Abstract:Human pluripotent stem cells (hPSCs) are powerful tools for regenerative therapy and studying human developmental biology, attributing to their ability to differentiate into many functional cell types in the body. The main challenge in realizing hPSC potential is to guide their differentiation in a well-controlled manner. One way to control the cell differentiation process is to recapitulate during in vitro culture the key events in embryogenesis to obtain the three developmental germ layers from which all cell types arise. To achieve this goal, many techniques have been tested to obtain a cellular cluster, an embryoid body (EB), from both mouse and hPSCs. Generation of EBs that are homogeneous in size and shape would allow directed hPSC differentiation into desired cell types in a more synchronous manner and define the roles of cell–cell interaction and spatial organization in lineage specification in a setting similar to in vivo embryonic development. However, previous success in uniform EB formation from mouse PSCs cannot be extrapolated to hPSCs possibly due to the destabilization of adherens junctions on cell surfaces during the dissociation into single cells, making hPSCs extremely vulnerable to cell death. Recently, new advances have emerged to form uniform human embryoid bodies (hEBs) from dissociated single cells of hPSCs. In this review, the existing methods for hEB production from hPSCs and the results on the downstream differentiation of the hEBs are described with emphases on the efficiency, homogeneity, scalability, and reproducibility of the hEB formation process and the yield in terminal differentiation. New trends in hEB production and directed differentiation are discussed. Journal:Stem Cells and Development. July 15, 2015, 24(14): 1595-1609. Abstract:A simple, scalable, and reproducible technology that allows direct formation of large numbers of homogeneous and synchronized embryoid bodies (EBs) of defined sizes from dissociated human induced pluripotent stem cells (hiPSCs) was developed. 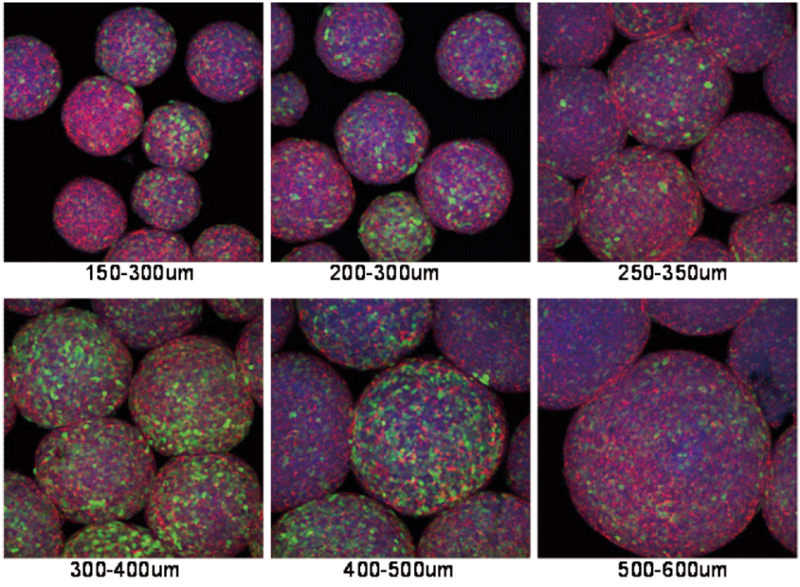 Non-cell-adhesive hydrogels were used to create round-bottom microwells to host dissociated hiPSCs. No Rho-associated kinase inhibitor (ROCK-i), or centrifugation was needed and the side effects of ROCK-i can be avoided. The key requirement for the successful EB formation in addition to the non-cell-adhesive round-bottom microwells is the input cell density per microwell. Too few or too many cells loaded into the microwells will compromise the EB formation process. In parallel, we have tested our microwell-based system for homogeneous hEB formation from dissociated human embryonic stem cells (hESCs). Successful production of homogeneous hEBs from dissociated hESCs in the absence of ROCK-i and centrifugation was achieved within an optimal range of input cell density per microwell. Both the hiPSC- and hESC-derived hEBs expressed key proteins characteristic of all the three developmental germ layers, confirming their EB identity. This novel EB production technology may represent a versatile platform for the production of homogeneous EBs from dissociated human pluripotent stem cells (hPSCs). CellSphere™ is the simplest way to culture all kind of cells in 3D I ever found. It’s the best quantitative method with stable uniform cell culture environment.